You are here: Home / Domains, Producers & Appellations / Roussillon – How Sweet It Is! Roussillon – How Sweet It Is! Pure poetry, this land of imposing peaks etched in granite and windswept, coarse plains strewn with the fractionalization of millions of years of geological disruption. Gnarled vines seem to claw their way up through the pulverized topsoil and by the tens of thousands speak with a single voice that resonates from the Pyrenees to the Mediterranean sea. Roussillon – bridging two worlds! This is Roussillon – a place of breathtaking beauty and singular individualism. The gruff voices and sun-baked, weather worn visages of the men who have toiled here for centuries to conquer the vicissitudes of the vine stand in marked contrast to the melodic nature of the local dialect – one that, with the wines, is deeply rooted in the heart of Catalonia. Like its more visible Languedoc neighbor to the north, Roussillon bears the imprint of the great mariners of Asia Minor – the Phocaeans. These intrepid early-Greek voyagers first established a presence in the region in 600 BC when they colonized the strategic, Mediterranean port of Massalia or Marseille well before the Romans dared venture to this distant territory. Pushing further to the southwest towards the Cevennes mountains and finally to the border with Catalonia and the Pyrenees they introduced the vine first to the Languedoc and subsequently to Roussillon. Yet, due to the latter’s even more forbidding landscape their presence and the vine’s penetration here were felt in a much more limited fashion. In 1344, Peter IV of Aragon ruling from Barcelona, united Northern Catalonia to the Crown of Aragon. It was not until 1659 when Louis XIV’s armies forced Spain to capitulate and ratify the Treaty of the Pyrenees that Roussillon became inextricably linked to France. 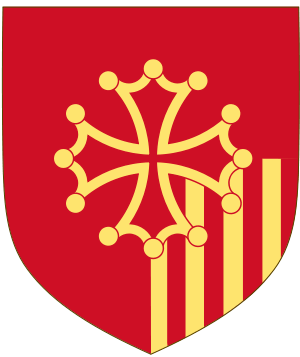 French efforts to build political allegiance were met with marked success, yet outside of the capital Perpignan, a campaign to force a shift in cultural identity on the area’s inhabitants from its Catalan heritage was largely a failure – so deep were its historical ties to its immediate southern neighbor. Iberian influence is clear as well in the region’s grape varieties. Traditional cultivars with Spanish names the likes of Cariñena, Maccabéo, Garnacha, Matarò all trumpet this rich history. 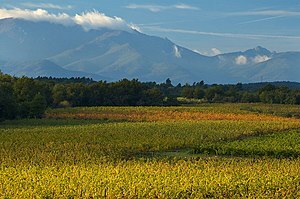 Roussillon, or Les Pyrenees Orientales as this département is known in France, is also home to many of the same varieties that are common to the Languedoc, Provence and the Rhone valley. Syrah, Roussanne, Marsanne, Muscat à Petits Grains and here regional varieties like Tourbat and Muscat d’Alexandrie set the table for a region that is famed for producing fully 90% of the VDN or, vins doux naturels dessert-style wines for all of France! Stunning vineyards of Roussillon with Pyrenees in the background. 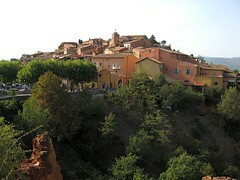 Roussillon is traversed by three rivers that take their source high up in the Pyrenees mountains. Nutrient-rich, cold waters wash over the deep, red clay that is the hallmark of the region depositing stony, alluvial soils along the way. From the limestone, schist and marl cliffs of Maury to the shallow, meager soils edging just north of the Têt river, Roussillon’s rugged, sun-drenched terrain offers the perfect environment for sweet wines of pronounced body and intensity. White grapes generally find a home in the poorer, stony soils giving them aromatic lift and a bright, refreshing profile. Reds are most often found in the rockier, higher elevation zones developing more structure, weight and breadth. And, while there are a handful of still wines from spicy, earthy, rustic reds to generously aromatic whites from appellations such as Cotes du Roussillon and the historical, seaside wine district of Collioure, the defining process known as mutage drives wine production here along with the region’s celebrity. Mutage refers to the deliberate addition of pure alcohol (90%+) in the wine’s fermentation process which has the effect of killing the yeast that convert sugars to alcohol. The remaining non-fermented sugars are referred to as being residual. Ultimate sweetness is thus determined by the stage at which the fortifying, pure alcohol is added and where the fermentation stops. The winemaker achieves a sweet, fortified wine that is then purposely subjected to oxygen contact (oxidation) in some form or to a reductive winemaking regimen. Each, whether for reds or whites, make for compelling wines of unique character. Making these wines reductively involves minimizing oxygen exposure and thus constantly topping up the barrels or tanks so that the wines gain flavor and bright fruit intensity. The oxidative process in contrast involves deliberate exposure to oxygen where the barrels or tanks are not topped up. The white wines of Muscat de Rivesaltes show great aromatic vibrancy with notes of peach, apricot, honey, orange blossom, honey suckle and a generously rich texture. The red wines made in this style and principally from the black Grenache variety boast coffee, fig, chocolate, hints of caramel and black tea. Each essentially has its own stylistic nomenclature for these ageing processes. Reductively produced reds are now uniformly labeled with a designation referred to as Grenat. The oxidized reds are called Tuilé (a reference to the color of red roof tiles) if somewhat oxidized or Rancio (brown) if significantly so. Whites are not commonly made in a reductive manner. If oxidized they are labeled Ambré (amber) and like the red wines, Rancio (brown) if significantly oxidative. VDN wines are typically in the range of roughly 15% alcohol. They are brilliant with desserts or as an apéritif. Roussillon, the southernmost wine-producing district in France jealously guards its precious bounty. Its secrets are only revealed to those intrepid enough to challenge their curiosity and venture into its unique expression of artisan wine craft. The door is ajar, you may now step inside! Slave to the grape – worse fates there have been! Thanks so much Frances. As you know we all do this as a labor of love first and foremost. My passion for wine here intersects with my love of music, art, history and literature and is an attempt to delve into the rich humanity behind every region. Sante! Most people don’t realize but the funny looking uniforms worn by the Greek guards are actually Catalan vestiges of the former Iberian colony in the Greek heartland. But this East-West interaction of the Mediterranean basin extremes was a “two-way street” as the old city of Tyre too left its mark on the Gallo-Iberian cast. It is very likely that these early Phoenician are actually the ones that brought to this Franco-Spanish region many of the products we normally associate with western Mediterranean. Long live the Lebanese traders!